This Swordfish, Raspberry and Ají Limo Ceviche has become a firm favourite with my clients this year. Autumn may be my favourite season for all sorts of reasons but summertime, with its colourful and fragrant bounty, is pretty hard to beat! Today’s recipe came about because of the Ají Limo, a chilli I was determined to use in a ceviche before the summer was out! Every summer, I grow a variety of chilli plants, and this one was no exception. Despite a miserable few months, weather wise, my chillies have done rather well and I’m just in love with the 3 Peruvian varieties that I’ve grown for the very first time: the Amarillo, the Limo and the Omnicolour. As soon as I tasted the Ají Limo (also known as Lemon Drop pepper), I knew I had to use it fresh in a salad or better still, in a ceviche. The lemony flavour, in my opinion, would go so well with fresh seafood that requires minimum or no cooking at all. 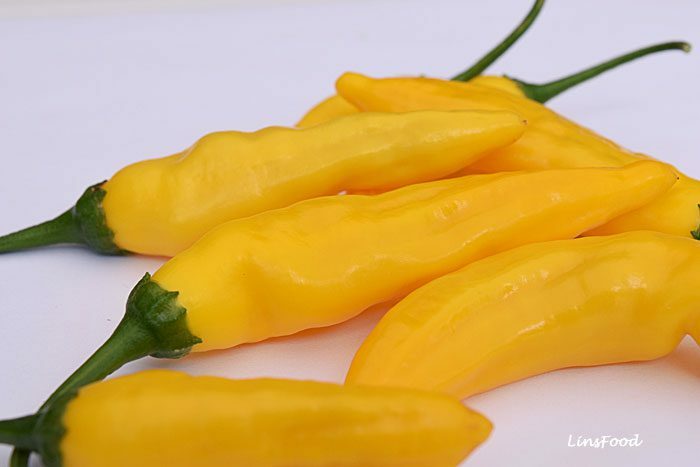 So, it all began with the Lemon Drop Pepper! And if you are familiar with Peruvian food, you know that it is in fact, a favourite ceviche ingredient. After ruling out strawberries and the usual mango, watermelon and pineapple, I finally settled on raspberries. Raspberries have a beautiful complex aroma: citrus, floral, grassy and even a touch of clove. I figured the citrus part of the raspberry would just love the lemon chilli and the lime juice for the marinade! So, that was that! What next? 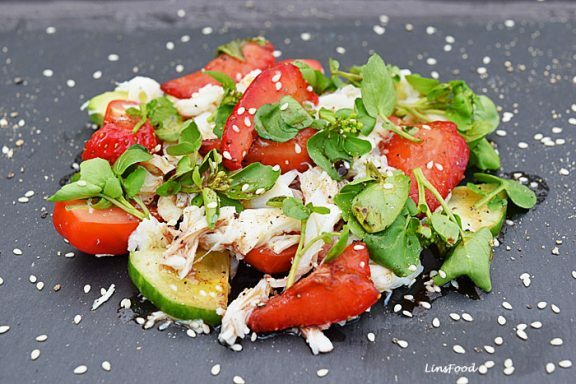 Besides the fish, the rest of the ingredients all play a colourful and tasty part to the main ensemble with a mix of sweet, fresh and just a hint of texture. The final flavour of this Swordfish, Raspberry and Ají Limo Ceviche marinade is tinglingly delicious! It’s got so many aromas and flavours going on – tart, sweet, spicy and grassy. I love dipping some fresh bread into the “sauce”, what the Peruvians call leche de tigre, or tiger’s milk. Leche de tigre is the marinade sauce or milk that you get after making a ceviche. Some serve it along with the fish, some serve it separately in a glass. And each Peruvian chef has his own recipe, I know a Peruvian chef of Japanese ancestry (there are many Japanese in Peru) who uses dashi to make his ceviche. Dashi is Japanese stock. Make sure it’s super, super fresh! And when you slice it, you only want the white part of the fish meat, none of the brown, which will mar the final, clean flavour. If you can’t get swordfish, any non fatty fish will do, monkfish would be awesome in this. If you can’t get them fresh, frozen ones will do too, especially for the marinade. For the ones that are going to be chopped up, don’t worry if they fall apart, that’ll work perfectly fine in the whole ceviche. Here, as mentioned, I’m using the Lemon Drop pepper. I only have these because I’m growing them, which reminds me, I must start freezing some now! They are not a common chilli outside South America, so if you don’t have access to these, any chilli of your choice will do, red or green. Chillies are naturally fruity, so whatever chilli you decide to use will be perfectly fine here. Turn this into an escabeche by lightly frying the fish pieces in 1 tablespoon of olive oil. Leave to cool to room temperature, then pour the marinade all over and serve! Easy peasy. Let's make the marinade first by crushing the raspberries with a fork in a small bowl. Mix about 1 tbsp of the lime juice with the crushed raspberries and strain this whole mix using a medium mesh strainer into a medium sized bowl. Add the rest of the lime juice in. Now chop the garlic up finely and add to the lime and raspberry juice. 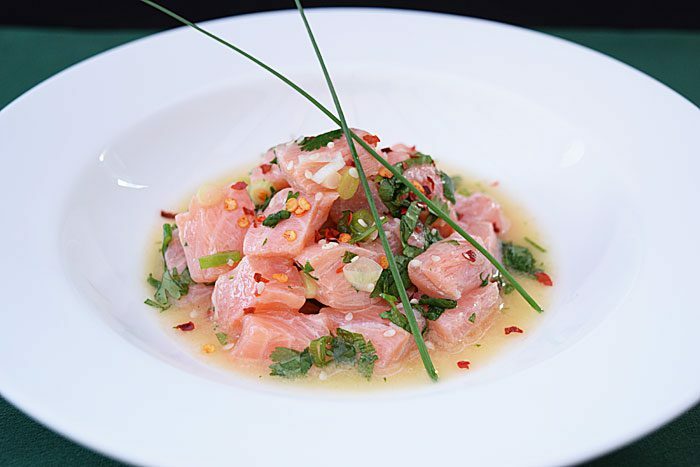 Chop the chilli up, not too finely, so that you can see it and taste it in the ceviche, as in the image. Slice the spring onions up into thin rounds and place the whole lot into the marinade juice. Add the salt and a very light sprinkling of freshly ground black pepper. Taste the marinade, add more salt if you think it needs it. Set aside in the fridge. Quarter the 8 remaining raspberries up. Chop the tomato up into tiny pieces. Time to prepare the fish. Using a sharp knife, cut the fish up into little cubes, making sure to get rid of any dark flesh. I usually reserve the dark flesh for cooking with, I toss it in soups or stir fries. Pat the fish cubes dry if they're wet and put the whole lot into the ceviche marinade. Toss the whole lot thoroughly but gently, making sure all the pieces are fully coated. Cover and place in the fridge for 5 minutes. To serve, divide into 4 portions, drizzle with the ceviche marinade (the leche de tigre) and scatter some chopped up coriander all over with a light hand. My brother bought swordfish last night and we don’t know what to cook. So we decided to google for a swordfish recipe and we bumped into your blog! Thanks for sharing. We will try this. Thank you so much! Let me know if you do! Can you believe that I never tried swordfish before? This recipe would be perfect to try! Not a fan of raw fish but my husband loves those kind of food. It would be something that would interest him. You could always lightly cook the fish. I’m not a fish eater, but this looks so good. I would have never know you can eat swordfish like this. You should try fish, it’s good for you! Oh this sound super flavorful. I think we’d love having this for a special summery meal! I love a yummy ceviche. The raspberries in this one is the perfect pairing. Can’t wait to try them. I’ve had swordfish once before and it was delicious! I’ll have to try this recipe! awww, I love ceviche! That looks very enticing and colorful. Thanks for sharing! I haven’t tried something like that but it looks so delicious. What a perfect appetizer! Ah! Ceviche! One of the best dishes you can have with fresh seafood. It’s really nice and I’m sure this recipe is full of lovely flavors as well. 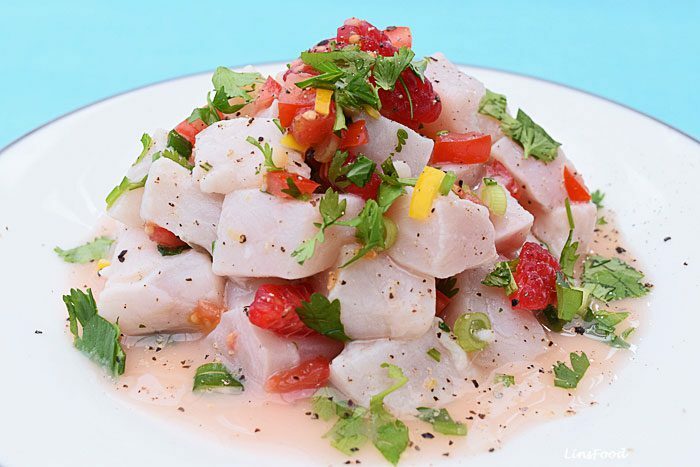 Ceviche is one dish that will definitely remind you of the summer! It’s perfect to have when you’re at the beach as well. 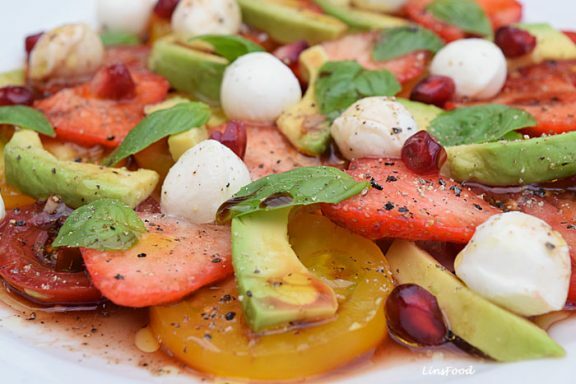 It’s fresh and it’s packed with flavors! Thanks for this recipe, I’m going to try it! Oh my gosh this looks really good!! I don’t think I have ever had a dish like this would be a great dinner! OH MY GOD!! It looks sooo delicious! I’m a big fan of ceviche and this recipe looks so amazing. I have to try it soon.